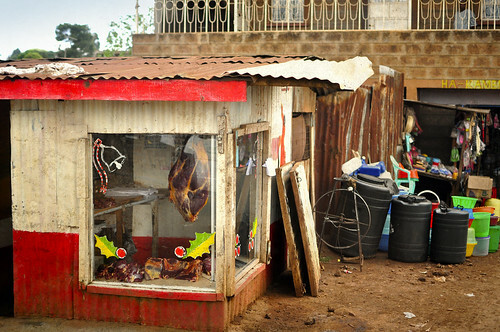 Butcher shop in a slum in Kawangare, Nairobi, Kenya (picture on Flickr by Brad Ruggles). It’s not only people who are rapidly urbanizing in Africa: people migrating from rural areas are bringing their livelihoods with them, which in Africa largely means their cattle, goats, sheep, chickens and pigs. A scientific report from researchers based in Nairobi, Kenya, investigating the benefits and harms of livestock keeping in two of Africa’s most crowded and sprawling cities —Nairobi and Ibadan — recommends that people ‘keep on keeping cows’ but keep them more carefully so as to reduce the risk of diseases being transmitted from livestock to people. Importantly, the study also finds that peer pressure — not health codes — is the answer to more careful management of the growing livestock enterprises in Africa’s slums and urban centres. This entry was posted in Uncategorized on April 8, 2013 by Dr Raziq.